Dirty carpets, mug and dust everywhere, stains on the furniture, windows through which no mortal could see a thing? If you are in West London, trust our skilled professionals in cleaning! Our highly efficient cleaning workers have passed courses and are certified. 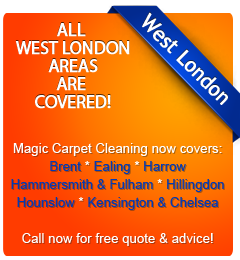 All the cleaning staff of Magic Carpet Cleaning strives to justify the highest expectations of our customers in West London. Get in touch with us by dialing 0208 861 0979 or simply use our contact form below to schedule a service. We have over seven years of carpet cleaning experience. We are fully trained, fully qualified and fully insured to tackle any cleaning job in all areas in West London! Steam carpet cleaning is an extremely efficient approach to cleaning. Spots and dust disappear without a trace, leaving behind a clean and fresh trace. We have the perfect products and machinery needed for carpet washing with steam. Thanks to the use of hot water, all the microbes in the tissue are destroyed. This ensures the end of allergies caused by dirt. The method of steam washing is suitable for families with children and pets. With clean and refreshing CARPETS, you insure a healthier work environment that will cause again your creativity and willingness to work with your employees. Magic Carpet Cleaners recommend dry cleaning of carpets and rugs. It is primarily used for cleansing large commercial objects such as offices, hotels, roads, banks, etc. This treatment does not require drying time, which is why it is a preferred method for its use in public buildings. Often because of the lack of spots and cleaning, the house looks old and shabby and its value decreases. Our cleaning staff works for you – we shall remove the stains from walls, floors, windows, textile floors and furniture. Dirt in the office also has no chance in front of our cleaning experts. They work with high precision and speed, using the best harmless products. No matter whether contaminated fabrics are made ​​from natural or synthetic materials, all blemishes are removed – blood stains, wine, coffee, pet urine, chewing gum or other contaminants. All you have to do to get rid of stains on your carpet, sofa, couch, anywhere at home or in the office, to us look now at 0208 861 0979 for all London areas. Leave the rest to Magic Carpet Cleaning!